The right platform will help you with creating content, promoting and distributing your content on the most effective channels at the optimal times, and providing analytical tools so you can continuously optimize and fine-tune your content marketing strategy. However, with so many content marketing technology options available, it can be difficult narrowing down the choices and finding the perfect solution for your business. If you're looking into content marketing platforms to streamline your content production and marketing plan, use these guidelines to help you find a platform that will work for you. Before we consider the finer points of comparing different content marketing platforms and choosing one to work with, it's important to define exactly what we mean when we say "content marketing platform". While every individual platform varies in terms of functionality and features, all solutions have a common goal of helping marketers to manage their content marketing strategy and be more efficient and effective in carrying out their content marketing plan. Content marketing can be highly effective but it's also time-consuming and resource intensive to manage. 60% of marketers produce at least one new content asset every day. A content marketing platform can help to make this process faster and easier. A platform might include tools for content creation, optimization, promotion, automation, and analytics. There's unlikely to be one platform that provides all the functionality you need to carry out your content marketing plan. 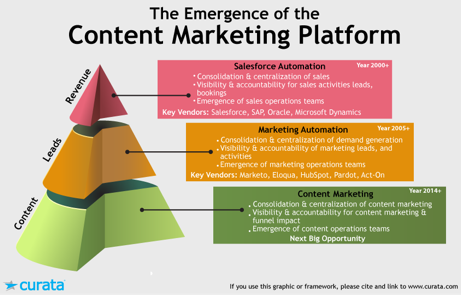 But your content marketing platform should act as the central management tool that integrates with the rest of your martech stack and ties everything together. Just in case you're not entirely sold on investing in a content marketing platform, let's start with a quick rundown of some of the advantages of using this type of software as an integral part of your marketing strategy. A content marketing platform helps to speed up your content creation, optimization, and promotion by automating repetitive tasks and using intelligent algorithms to cut down time-consuming testing and optimization cycles. Using a centralized platform to manage all content production ensures a consistent brand voice and that all marketing communications adhere to set standards and are compliant with any applicable regulations and guidelines. It's notoriously difficult to measure the ROI of content marketing campaigns, but your content marketing platform can make this a simple task. Advanced analysis and optimization tools also make it easy to identify the features of your best performing content so you can replicate its success. While standalone marketing software solutions tend to focus on one or two specific functions, content marketing platforms more closely resemble a suite of different tools. This combined functionality enables you to use a single central platform to manage all your content marketing activities and avoids issues with duplication of data and different team members using different tools to perform the same tasks. Deciding what to write about can be one of the trickiest parts of content marketing. A good platform will provide you with tools for competitor and keyword research and insights into your audience so you can choose topics that are likely to be useful and of interest. Many platforms also have tools to help you create your content, including sourcing images, curating content from other sources, and optimizing your content layout for SEO and conversions. If there are several people involved in your content marketing process, you'll need some way of making sure they can work together, communicate, and collaborate efficiently. Content marketing platforms usually include tools to help you manage the whole process of content production with several members. This may include an editorial calendar and cloud-based collaborative editing software. A content marketing platform should help you to manage all your content -- both existing and new content that you create within the platform. Properly organizing your content means it's easy to find for later re-purposing, and when analytics data is collected you'll be able to see at a glance which content is performing well or poorly. After content is published, your job isn't done. For your content marketing plan to be successful you also need to promote it to the right people at the right times. A marketing platform can use data to find the optimal places to promote your content and automate the task, leaving your team free to work on other tasks. The key to successful content marketing is continual improvement. Your content marketing platform will collect data to help you learn more about how your content is performing so that you can improve existing content and optimize the production of new content. Once you have a clearer idea of what exactly you want from your content marketing platform, you'll probably come across several solutions that may seem suitable for your organization. Before you make a decision based purely on the number of features each platform offers, it's worth asking yourself a few important questions about how each solution will align with your business and marketing strategy. What is your ongoing budget? You need to consider not only the initial investment of the software but also the costs to implement it and keep it running. Consider additional hardware needs, support, license fees, and training -- all of these costs must be included when deciding on your investment and calculating ROI. How easy is it to use? A complex system with advanced functionality may seem appealing but it will be useless if your employees don't use it because the learning curve is so steep. Think carefully about who exactly will be using the platform, their existing knowledge and skills, and how much further training will be needed to integrate the platform fully into your everyday workflow. Does it integrate with your existing tools and systems? You most likely already have other software tools that you rely on for the day-to-day running of your business. While it may be acceptable for a new platform to replace some of these tools, you also need to ensure that it will work with your essential systems and existing marketing software, such as your CRM or email marketing platform. What support is available? Does the platform offer a 24/7 helpdesk if you run into any issues? What is the service level agreement and how soon can you expect support tickets to be responded to? How flexible is the solution? Will it scale with you as your business grows? Does the license support a set number of users? How will this change if your team grows in the future? If your content marketing needs change can the software adapt to suit? How often is the platform updated? Is the vendor known for innovation and have they designed it with the future in mind? In the fast-moving world of marketing technology, it's essential to choose a solution that will evolve as quickly as the tools and techniques around it. What other clients are already using the platform? Does the vendor have a good track record and good reviews? How detailed is the reporting functionality and analytics? Is data collected and reported in real time? Is it easy to calculate the ROI of each of your campaigns? Do the reports include actionable insights? There's a lot to think about and it's certainly not a decision that should be made based on what your competitors are using or which platform simply has the most features. You need to carefully consider what goals you want to achieve, the specific features that are important to you, and how easily the platform can be implemented into your existing business workflow. Make sure that key members of your content marketing team are involved in the decision -- after all, they'll be the ones using it. Once you've narrowed your choices down to a few potential vendors, make sure to book a demo so you can get a real feel of how to use the platform and if it will work for your business. Subscribe to the Clever Content Club!